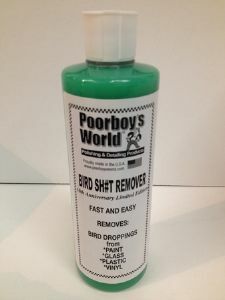 Poorboys World Bird Sh#t remover is a quirky named product that does exactly what it says on the bottle! Poorboys World Bird Sh#t Remover is one of the fastest and safest ways to remove bird droppings, bugs, sap, salt and sand, and fresh road tar from any surface. - If droppings are baked in to the finish, leave BSR on a little longer to loosen gently. - For bird dropping stains, use Poorboys World Professional Polish. Do not use abrasive compounds.